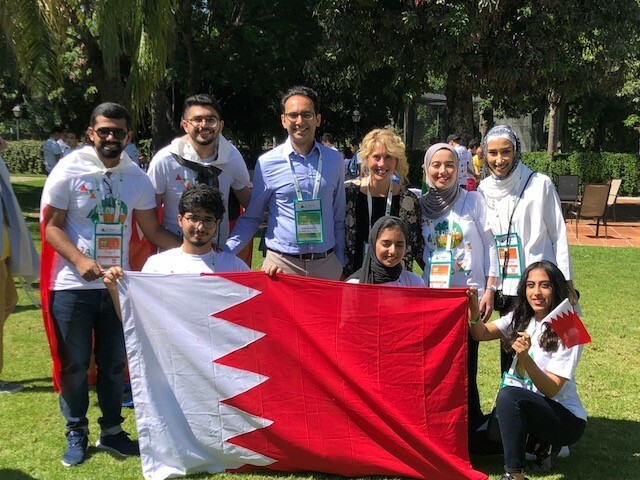 INJAZ Bahrain recently sent a delegation of alumni students, sponsored by Tamkeen, to participate in the first Global JA Worldwide Youth Forum held in Morelos, Mexico. The five-day forum saw 600 students in attendance, representing more than 50 countries, who partook in 50+ entrepreneurship activities and one business competition per day. 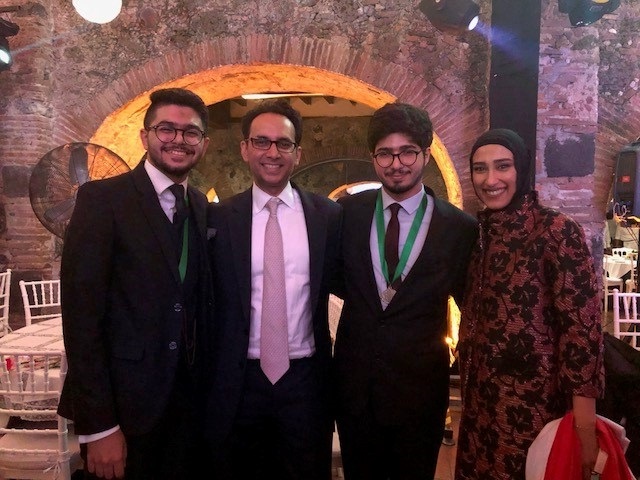 Mohamed AlMakeerat and Turki Al Qahtani came in 1st and 2nd during the ‘Pitch Competition’ while Noor Benshams came in 2nd in the ‘Change Makers’ category. Abdulrahman Al Sabagh was also nominated to the finals of the IQ competition. The first JA Worldwide Youth Forum was held in celebration of JA Worldwide’s 100th anniversary and is part of an 18-month centennial celebration. Over 700 people attended including JA staff, board members, students and chaperons from around the globe. Attendees benefited from world-class keynote speakers, alumni panels, entrepreneurial workshops, recreational and team-building activities and more. The Bahrain delegation consisted of eight people: Bayan Ahmed, Noor Benshams and Mohamed AlMakeerat (University of Bahrain). 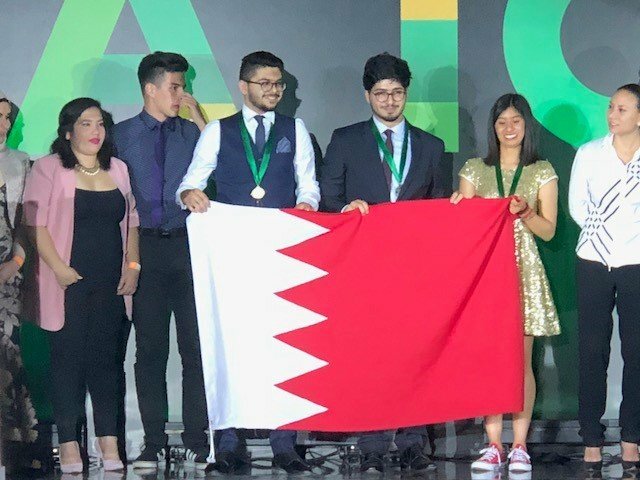 Noor Ramzi Al Awadi, Yousif Khalid Al-Isa and Abdulrahman Al Sabagh (Bahrain Polytechnic). Turki Al Qahtani (Ibn Khuldoon National School) and Fatima Abdulrahman (INJAZ Bahrain) who served as chaperon. Mohamed AlMakeerat won 1st place during the ‘Pitch Competition’ while Turki Al Qahtani grabbed second in the same category. The competition is judged based on entrepreneurial culture based on pitch and mentorship, entrepreneurial talent, problem solving in specific market segments and is a practice opportunity on how to approach investment funds. In the ‘Change Makers’ competition, students dressed up as their favorite changemaker in history and deliver a presentation to the forum. Noor Benshams won the 2nd place spot presenting as HRH Princess Sabeeka Bint Ebrahim Al Khalifa, Wife of the King of Bahrain and President of the Supreme Council for Women. Since its establishment in 2005, INJAZ Bahrain aims to arm the youth with the necessary skills and understandings to take on the work force in the world of finance and entrepreneurship. The organization was able to reach 160,000 students from more than 250 schools and universities through 5,000 volunteers. If you would like to learn more about volunteering with INJAZ Bahrain, please visit http://injazbh.org/inner.aspx?PMID=5#44 .